Once you have set up the DS64 to operate the type of turnouts you will use, the next step is to hook up the turnouts to the outputs of the DS64. Each type of turnout machine has specific requirements for wiring. Note: The DS64 is configured for either for solenoid turnouts (the default setting) OR slow motion turnouts. Only one type of turnout motor can be used on any particular DS64. Note: Multiple turnout machines can be operated on a single DS64 output. For example, you can run 2 Peco or Atlas Snap Switches on a single DS64 output. 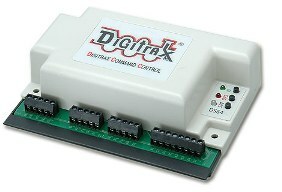 Up to 4 Kato Unitrack switches (such as the Unitrack double crossover) can be operated a on a single DS64 output. Note: If you find that your turnout is operating “backwards” simply switch the + & - wire connections to achieve correct operation.